For most of Earth’s 4.6-billion-year history, life left behind few good fossils. That began to change during the Cambrian Period, roughly 545 to 505 million years ago. 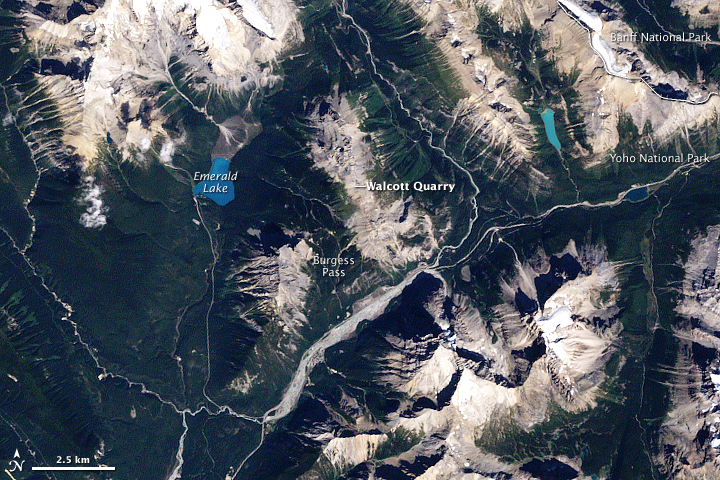 One of the world’s best Cambrian quarries is the Burgess Shale in British Columbia’s Yoho National Park. 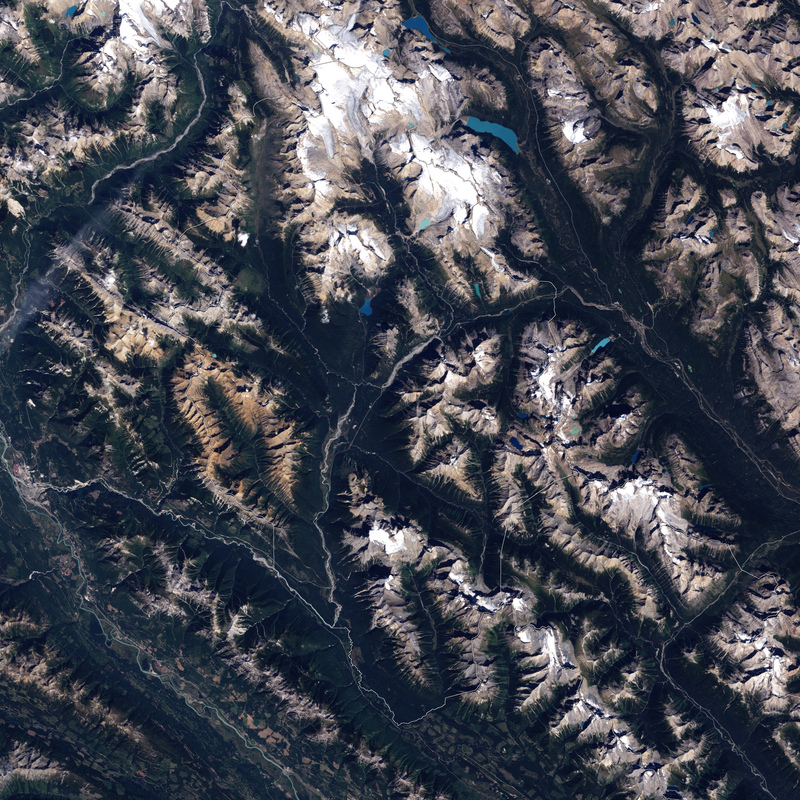 The Advanced Land Imager (ALI) on NASA’s Earth Observing-1 (EO-1) satellite captured this true-color image of the park including the quarry on August 29, 2001. The quarry sits in a landscape of naked ridges, forested slopes, meandering rivers, and jewel-toned lakes. The Sun is shining from the southeast, and the rugged mountains of the park cast shadows to the northwest. The shale-covered fossil quarry is pale beige-gray. Although fossils had been collected in Yoho National Park since the 1880s, detailed studies only began in 1909 when Charles Doolittle Walcott, a curator at the Smithsonian Institution, began collecting and describing fossils. Decades later, paleontologists continued to examine and classify the finds, such as Hallucigenia and Opabinia. Although Walcott’s quarry now sits upon a mountain ridge, it was probably once on the sea floor. An underwater avalanche of fine sediments rapidly buried the local animals, preserving even their soft tissues—a rarity in fossil preservation. Burgess Shale Geoscience Foundation. Accessed August 21, 2009. Collins, D. (2009, August 20). Misadventures in the Burgess Shale. Nature, 460, 952-953. Earle, S. (2001, September). A visit to the Burgess Shale – July 2001. Vancouver Island University. Accessed August 21, 2009. National Museum of Natural History Department of Paleobiology. (2008). Burgess Shale. Smithsonian Institution. Accessed August 21, 2009. Parks of Canada. (2009, July 21). Yoho National Park of Canada. Accessed August 21, 2009.